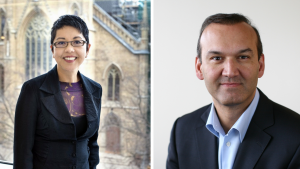 Professors Patricia O’Campo, Raisa Deber and Prabhat Jha were named fellows of the Royal Society of Canada, joining 2,000 Canadian artists, scientists and scholars in this prestigious group. “It’s thrilling to be recognized by a group of outstanding scientists who are among the best scientists in Canada. Being recognized for the body of your research, not just one paper or study, just feels great,” said O’Campo, a Professor of Social Epidemiology at DLSPH. With 30 years under her belt, O’Campo is a pioneer in epidemiology. When she began her training, traditional epidemiology focused on clinical care, epidemics and patient factors that determined major health problems like cancer and cardiovascular health. Her early research helped shape what is now known as social epidemiology. Her work is considered ground-breaking as few epidemiologists looked outside of the clinical world to the social and economic elements of society as sources for epidemics, and even treated poverty as a nuisance variable. In fact, her first professional studies were met with resistance. “Epidemiologists misunderstood the goals of my early work, and reviewers questioned the utility of looking beyond individual characteristics as factors that were important in determining poor health,” said O’Campo who is also the Interim Vice President of Research at St. Michael’s Hospital. “With my first paper, the journal put me through two years of statistical review to go through the data. I was arguing that people’s neighbourhoods affect their overall health,” said O’Campo, noting that it was one of the first papers to examine social determinants of health, specifically the impact of city neighbourhoods on health. Prabhat Jha is a globally recognized epidemiologist conducting ground-breaking work co-sponsored by St. Michael’s Hospital, the University of Toronto and dozens of other collaborating centres. He leads the Centre of Global Health Research and the Million Death Study, a big project enabling middle-to-low-income countries to better quantify the causes of death. “Out of most of the deaths in the world, approximately 60 million of them, 45 million occur in developing countries, and two-thirds don’t have the cause of death as many occur at home,” said Jha, Professor and Dalla Lana Chair in Global Health and Epidemiology. As an epidemiologist, Jha maintains that death statistics are crucial in public health as they help identify major trends like declines in child mortality, and the rise in tobacco-attributable deaths. If a death occurred, the team implements a simple two-page form to capture key symptoms and treatment history. Two of 400 physicians who are working online, code the completed form and classify these deaths. According to Jha, it is a simple, cheap and robust way of monitoring causes of death. “The Million Death Study took ten years to scale up in India and is now used in other countries,” he said. Jha has established himself as a central figure in global health epidemiology and economics in the last decade. He has worked in advisory roles for various governments, including on President Barack Obama’s global health plan. His publications enabled the first-ever global treaty on health, aimed at reducing smoking. “On behalf of the DLSPH community, I congratulate Patricia, Raisa and Prabhat on this amazing accomplishment. Their acceptance in this prestigious group speaks strongly to the importance of public health in science, medicine and academia. These researchers represent our diverse research community whose impact reaches all corners of the world,” said Adalsteinn Brown, Dean of the DLSPH. This award is bestowed on a selected few members of the scientific community. This year’s recipients also include Professor Raisa Deber in the Institute of Health Policy, Management and Evaluation.